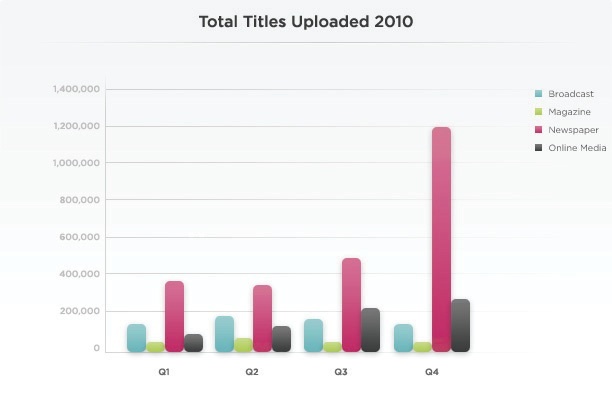 Our quarterly online video report produced along with partners at TubeMogul highlights some of the interesting trends that emerged in 2010 in the industry. Today we'll take a closer look at the trends in the newspaper category that speak to videos news organizations present on their websites, alongside feature articles or in video galleries in Brightcove players. 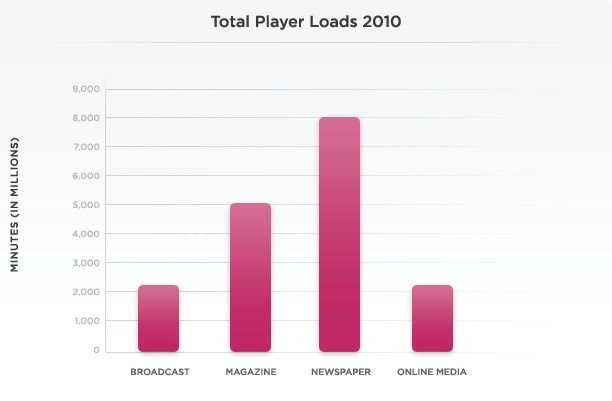 Newspapers also had the highest number of player loads across all categories for the year, suggesting that newspapers have embedded video players across more pages and have more total page views than other media categories. 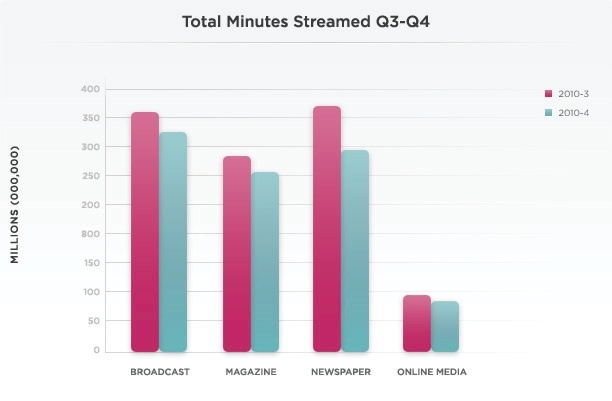 The newspaper category overtook broadcasters in minutes streamed in Q3, but the broadcast category regained its top position in Q4. Video coverage of the World Cup, fall elections, Pakistani floods, and trapped Chilean miners combined to overpower the broadcast industry during summer reruns, but the broadcasters came roaring back with popular new shows for the fall season. It was surprising to see newspapers beat out broadcasters in Q3, but we can be sure that these categories will continue to compete for audience attention as they represent the core content that viewers are seeking out online (news and entertainment). It's also worth keeping in mind that engagement rates between these two categories will continue to vary greatly, due to the short form nature of short video clips that newspapers produce, compared to the longer-form episode-length videos that broadcasters tend to produce that traditionally match half-hour or hour-long segments for TV. It's been fascinating to watch as newspapers have reimagined themselves as they've shifted their business online: they've gone from print media producers relying on the written word and image to tell stories, to using the full range of storytelling tools available online. Beet.TV coordinated an Online Video Journalism Summit, hosted by The Washington Post and sponsored by Brightcove. Representatives from major news outlets (The New York Times, msnbc.com, The Associated Press, CNN.com, Reuters, Yahoo!) discussed the opportunities, challenges, and concerns that online video presents to online news publishers today. Much of the conversation focused on how newspapers are becoming more comfortable producing video quickly and at scale to present stories. Kevin Roach of the AP discussed how they vetted citizen video of a death in Cairo, and the challenges of verifying user generated content (UGC) for covering breaking news. Ann Derry, Editorial Director for Video and Television described how traditionally writing-focused reporters are becoming more adept at recording and uploading video in real-time using portable and user-friendly devices like Flip Cameras and the iPhone 4 to capture video news from the field.